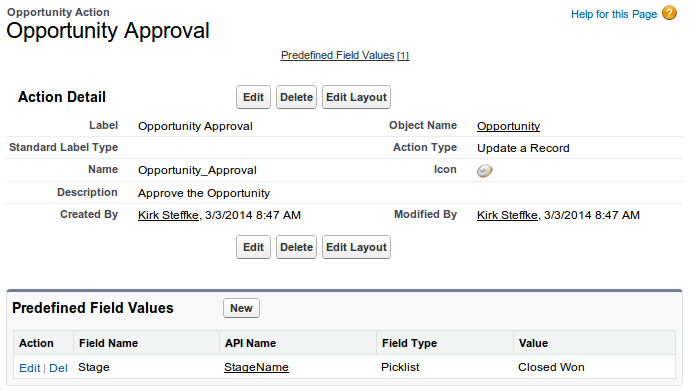 One of our Orgs required multiple field updates to be performed through a Publisher Action. The Action was working great from Salesforce1 as well as from the Chatter feed when it was realized that the field updates defined in one of the Publisher Actions was triggered from normal updates to the record. Update: Using inline editing, the "Approval" field is updated to "Approved" and then the "Save" button is clicked. After: Once the page refreshes from the "Save," the Stage has been flipped to "Closed Won" as defined in the Publisher Action. Again, this is in a brand new Developer Org where the only things created were the "Approval" picklist field and the Publisher Action. The above is not occurring due to any Apex Code behind or Workflow Rule Field Updates. After pinging Salesforce, we've learned that this is a known issue with a patch due out soon. A possible workaround was to add another Action, a Create action for the same entity, if possible, and locate it to the right of the Update Action. Other short-term solutions include hiding the Chatter feed when using inline editing mode or using the "Edit" mode and avoid using inline editing mode.